Maya Rodale's latest installment in her Writing Girls series features Eliza Fielding, daughter of a playwright and an actress, in who is in danger of losing her position at The London Weekly -- unless she comes up with a good story. And the most intriguing story in London is Sebastian Digby, the Duke of Wycliff, newly returned from traveling around the world. He's the latest in a long line of Wicked Wycliffs and everyone wants to know just how wild, wicked and scandalous this particular Wycliff is. Eliza manages to secure a position as housemaid in the duke's household and gains exclusive (and intimate) access to Sebastian's secrets. 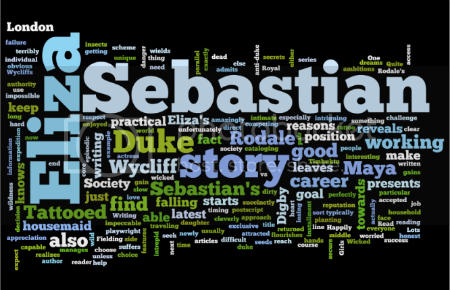 As Eliza's writing career flourishes, Sebastian's reputation suffers terribly -- and Eliza now has to make a difficult decision -- her career or Sebastian? And what about her heart and his? 1. Sebastian is an unconventional hero. The tattoo is the most obvious and obvert example -- he isn't a perfectly pristine duke who wields power and authority -- in fact, Sebastian is a sort of anti-duke. Society hasn't accepted him and he's having a hard time gaining appreciation from people who should, typically, be falling all over themselves in respect for his title. Sebastian also has an amazingly clear sense of himself. He admits to his wildness but also knows that he is capable of doing good and honest work. He isn't ashamed to approach the Royal Society to seek their help in funding his next expedition. He also isn't worried about getting his hands dirty -- in fact, when not in society, readers will find Sebastian cataloging dead insects or planting seeds. 2. Eliza is an intrepid heroine. Eliza is a working girl and is practical to the core. It is for practical reasons that Eliza starts working as a housemaid for the Duke of Wycliff. When she realizes that she is falling in love with Sebastian (and that Sebastian is attracted to her), she doesn't use this to further her writing career -- and Eliza is a very good writer! She is able to filter out what is relevant information and what isn't and her articles are about the Tattooed Duke are succinctly written. 3. Lots of twists in the story. 4. Sebastian vs Eliza -- whose dreams are more important? The way the author presents Sebastian and Eliza and their individual ambitions leaves the reader with having to choose -- whose side are you on? And it is an impossible choice to make -- Sebastian's goal to reach Timbuktu (and his reasons for doing so) are just as urgent as Eliza's need to keep her job. One tiny postscript: The story starts out slow and is episodic -- but it does gain momentum towards the middle.